How to train for the marathon and you don't know where to start? This Marathon walking and running schedule is the perfect solution for you! Download this Marathon Running Schedule for starters now! In order to rapidly manifest your needs to run the 26.219 miles (or 26 miles 385 yards) long-distance track in order to successfully participate in the coming marathon, you need to keep following a professional walking/running schedule, to make it to the finish line! This Marathon Running Schedule is suitable for beginners and will help you to structure your running activities in a responsible way! 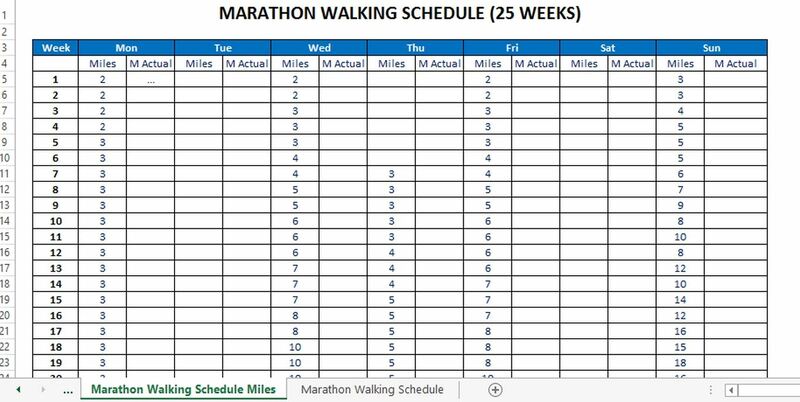 Full marathon schedule for 25 weeks (in miles). This Marathon Running Schedule for starters (in miles) will help you overcome personal goals and enables you to reach the next level of success in your life! Just like the fabled run of the Greek soldier Pheidippides, who was a messenger and run from the Battle of Marathon all the way up to Athens too report their victory.